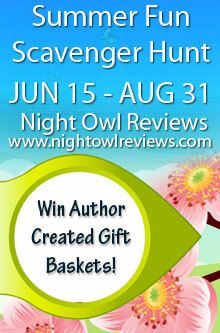 Today is the opening day for the Night Owl Reviews Summer Fun Scavenger Hunt. Learn about a host of authors, their books, join in the game hunt, and enter for a lot of chances to win author created gift baskets, gift cards, books, and more. It’s easy to join in this exciting summer literary event, which runs from June 15 - August 31. Just click on the logo below and then follow the simple instructions provided on the Night Owl Reviews site. Good luck - and have fun! !